6 A Future for Sea Ice? What do ivory gulls and polar bears have in common? All of them, and many other species, depend on sea ice—at least for part of the year. It’s uncertain how Arctic species will fare if sea ice continues to retreat and melts faster. Polar bears (Ursus maritimus) rely on sea ice as a platform for catching seals—and to travel: a highway when it is solid or a raft when it breaks up and floats. 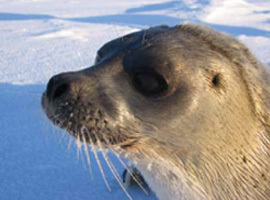 Ringed seals (Pusa hispida) are tied to sea ice for everything they do—rest, hunt, give birth, and nurse their young. 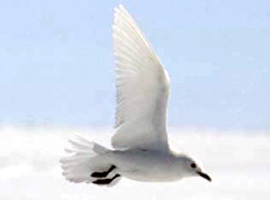 Ivory gulls (Pagophila eburnean) are scavengers that depend on leftovers from polar bear kills. 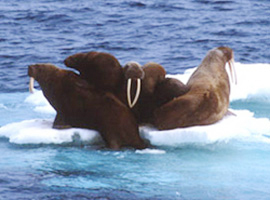 Walrus (Odobenus rosmarus) dive from sea ice to the sea bottom where they root out clams and other invertebrates. 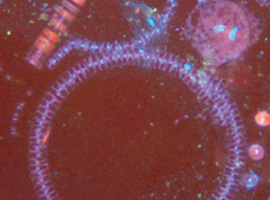 Ice algae (Fragillariopsis sp. and Nitschia sp.) 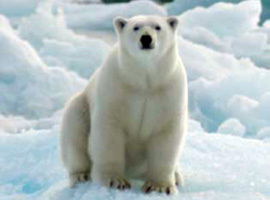 are food for many Arctic animals.